By Gordon Frickers 50 x 81 cm (20″ x 32″), oils on canvas, Commissioned. 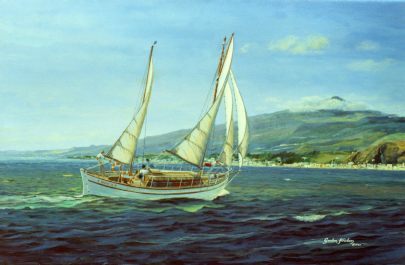 “Nizou IV off Taormina”, Sicily, Vesuvius in the background, a beautiful rendering of their classic family yacht, family shown onboard. 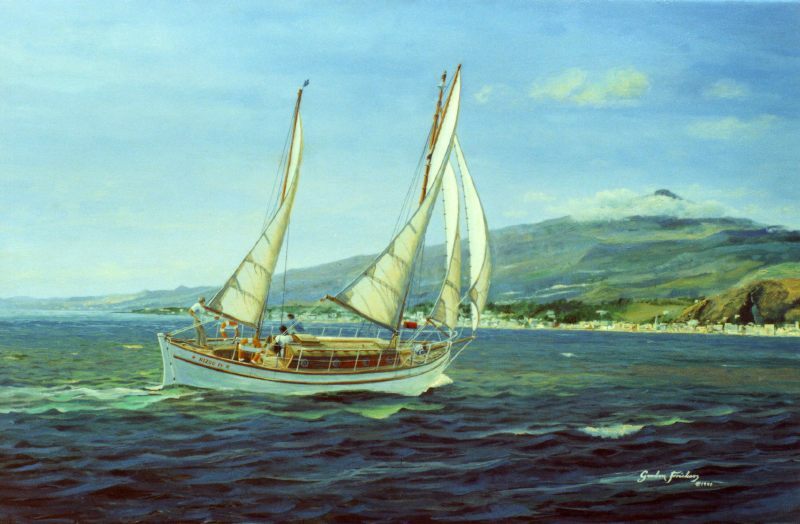 Claude Picault, an ex merchant mariner, who became a firm friend, decided to commission 2 marine paintings. This was a surprise as I met Claude and Silvie Picault while painting a long way inland in the south of France. Talk to me about your thoughts on a commission? Unfortunately, both “Nizou IV off Taormina in Sicily, Vesuvius in the background” and Claude’s other painting by my hand, “Liberty ship, North Atlantic Winter” have been stolen from the Hotel Belvedere, Sicily. Remember to insure your collection for it’s replacement value!! !